CHAMPAIGN, Ill. — By sequencing its genome, scientists are homing in on the genes and genetic pathways that allow the juicy pineapple plant to thrive in water-limited environments. The new findings, reported in the journal Nature Genetics, also open a new window on the complicated evolutionary history of grasses like sorghum and rice, which share a distant ancestor with pineapple. Humans have cultivated pineapple for more than 6,000 years, beginning in present-day southwest Brazil and northeast Paraguay. Today, more than 85 countries produce about 25 million metric tons of pineapple fruit each year, with a gross production value approaching $9 billion. Like many plants, the ancestors of pineapple and grasses experienced multiple doublings of their genomes. Tracking the remnants of these "whole-genome duplications" in different plant species helps researchers trace their shared – and independent – evolutionary histories. "Our analysis indicates that the pineapple genome has one fewer whole genome duplication than the grasses that share an ancestor with pineapple, making pineapple the best comparison group for the study of cereal crop genomes," said University of Illinois plant biology professor Ray Ming, who led the multi-institutional pineapple genome sequencing effort. 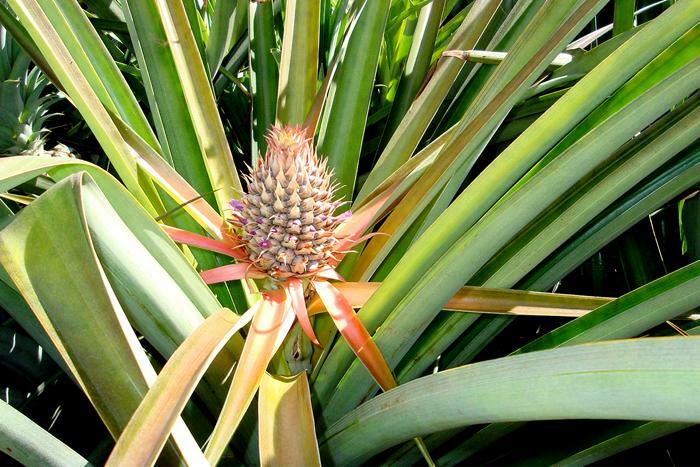 The work uncovered evidence of two whole-genome duplications in the pineapple's history, and validated previous findings of three such duplications in grasses. Photosynthesis converts solar energy to chemical energy, allowing plants to build the tissues that sustain life on Earth. Pineapple makes use of a special type of photosynthesis, called crassulacean acid metabolism, or CAM, which has evolved independently in more than 10,000 plant species. Pineapple is the most economically valuable plant among those 10,000 species, Ming said. Most crop plants use a different type of photosynthesis, called C3. "CAM plants use only 20 percent of the water used by typical C3 crop plants, and CAM plants can grow in dry, marginal lands that are unsuited for most crop plants," Ming said. A closer look at the pineapple genome revealed that some genes that contribute to CAM photosynthesis are regulated by the plant's circadian clock genes, which allow plants to differentiate day and night and adjust their metabolism accordingly. "This is the first time scientists have found a link between regulatory elements of CAM photosynthesis genes and circadian clock regulation," Ming said. "This makes sense, because CAM photosynthesis allows plants to close the pores in their leaves during the day and open them at night. This contributes to pineapple's resilience in hot, arid climates, as the plant loses very little moisture through its leaves during the day." CAM photosynthesis allows the plant to absorb and "fix carbon dioxide into molecules during the night, concentrate it in its leaves and release it the next day for photosynthesis," Ming said. "Drought is responsible for the majority of global crop loss, so understanding the mechanisms that plants have evolved to survive water stress is vital for engineering drought tolerance in crop species," the researchers wrote. "CAM plants can keep their stomata closed during the daytime… greatly reducing water loss." CAM and C4 photosynthesis, which is common among grasses, use many of the same enzymes to concentrate carbon dioxide in plant leaves, the researchers report. Other plants, such as soybeans, use the less efficient C3 photosynthesis, which lacks the CO2-concentrating mechanisms of C4 and CAM photosynthesis. The team discovered that CAM photosynthesis evolved by reconfiguring molecular pathways involved in C3 photosynthesis. "All plants contain the necessary genes for CAM photosynthesis, and the evolution of CAM simply requires rerouting of pre-existing pathways," they wrote. Understanding the evolution of these different types of photosynthesis will help scientists in their efforts to develop more productive, drought-tolerant varieties of essential crops, Ming said. For example, the U.S. Department of Energy has funded a project to explore the genetic mechanisms that enable CAM photosynthesis and drought tolerance in desert-adapted plants – with the aim of introducing those traits to potential biofuels crops. Adapting food crops to be more tolerant of drought will also help humans adapt to climate change, Ming said. "Higher water-use efficiency is a highly desirable trait, given the need to double food production by 2050 in the context of a changing climate," he said. The paper "The pineapple genome and the evolution of CAM photosynthesis" is available to members of the media from the U. of I. News Bureau.